As pumpkin spice latte season approaches and I continue to avoid Starbucks I thought it was time to get on with making my own coffee. mix them all up and heat them by either steaming with a frother or in the microwave. Add a shot or two of espresso. Chop up a few mushrooms, as many as you fancy. Chop up finely, half a clove of garlic. Rub some sea salt on it to grind it up a bit. add some cream. Bring to the boil and then simmer for a bit. Put half a cup of cous cous in a bowl. Add 3/4 cup of boiling water to the cous cous. Cover for five more minutes and then the food will be ready. Add the mushroom mix to the cous cous. The night we visited No. 4 Clifton Village couldn’t have been darker or wetter if we had come off a boat and landed in Alaska (in the dark). Compared to the horrible outside, the surroundings were softly lit and enticingly coloured all due to some recent refurbishing, apparently. Tapestry in rich red colours hung on the walls, the lighting was low and the tables were stripped down wood in not unpleasant tones. The dining room was half-empty so I thought maybe we should sit by a window but then realised all we’d be looking at would be a car park. Best to be by the opposite wall where the other tables and chairs weren’t right by us. Up close the tapestry was not tapestry after all but a wallpaper with a plastic feel that seemed to be peeling a bit down the bottom. A shame, admittedly, but I thought a glass of red wine would cheer up proceedings. My choice of red wine , an Australian Cabernet Sauvignon did not fare well in the crossing to England at all and was sharp and not fun to drink. Luckily towards the end of the large glass I was no longer too bothered. I just compare it to a delicious Yellow Tail Shiraz I tried recently where the cherry flavours practically melt into a syrup as you drink and wish that there had been a maitre’d or someone available to guide me to a better selection. No. 4 Clifton Village just isn’t that kind of place. There was a short menu of four starters and four mains with two of the former being vegetarian and one of the mains. That’s quite impressive these days so I was most pleased. We ordered some bread with olives until the food came along and were quickly disappointed. The bread and olives were served with cold butter in individual foil packets, the basil oil, which was promoted by our waitress, was a lovely vivid green but in taste was bland and pointless. All of this would have been somewhat acceptable if the bread was not so tasteless. With the number of very good bakeries that Bristol hosts it is a huge shame to serve such uninspiring offerings. The rest of the food for me was a bit more palatable. My starter of bruleed goat’s cheese, walnut and beetroot done in two ways was just gorgeous in its slightly caramelised appearance, the sweetness of the dark red puree, the golden beetroot and the scatterings of something sweeter and crunchy. I loved it and would happily go back for more. My main was curried arancini balls with cauliflower and apricot and these were also rather tasty and more filling. My partner’s lamb dish was just lamb, however. No sides, which would have been an additional £3 and would have taken this dish to nearly £20. Considering we’d been to the Ox recently where their special is rump steak, chips and a glass of wine for £12.50 there was an instant dislike to this patently inferior dish with its much higher cost. There are plenty of great restaurants in Bristol at the moment which offer similar priced food and No 4 accommodate this by offering many price deals. January, for example is two courses for £10. If I was a meat-eater I would still rather go to the Ox on Corn Street or Flinty Red on Cotham Hill. As a vegetarian I would wait for a different main to go on the menu but wouldn’t say no to another visit if the bread was improved. In fact I suggest that in Mediterranean style, a basket of warm bread be served with some proper butter to all diners. It would help them be more satisfied with the small portions. Who feeds Bristol and what can we do about it? Did you know that 10 in 35 Bristol wards don’t have a greengrocer? According to where you live in the city, this may or may not surprise you. I live in the city centre and while I hear of people selling fresh fruit and vegetables in the Bear Pit on Pero’s Bridge and on North Street, I can’t think of a single dedicated greengrocer near me. People in Brislington and Lockleaze have none while those in Westbury-on-Trym have four. Nationally, 75% of food retail is controlled by four companies, collectively known as ‘the Big Four’ and in the city centre there is evidence that there is a higher concentration of supermarkets than in other parts of the country. The big consequence of this is that some people, usually in the poorer parts of the city, have little choice as to where to buy their food (see reports below). The Bristol Good Food Plan was published by the Bristol Food Policy Council which was launched in March, 2011, at the Bristol Food Conference. 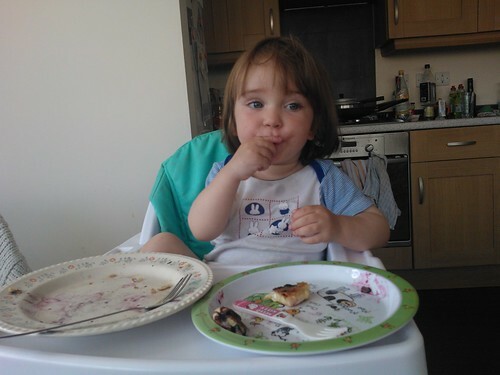 It was based on a key recommendation from the Who Feeds Bristol report written by Joy Carey. Bristol is the first city in the UK to have a Food Policy Council. We now also have a plan about what to do. Stay tuned. 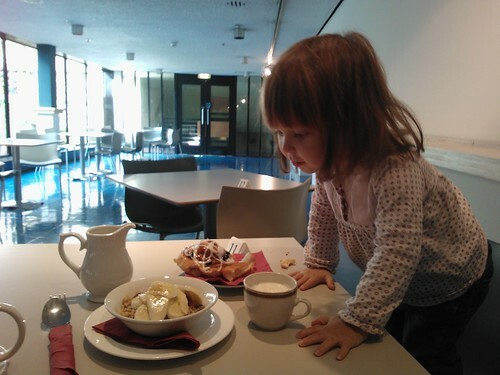 On a Tuesday morning, before swimming, my little girl and I went for breakfast at the Bristol Old Vic. We ate at Flinty Red on the first floor. The divine restaurant from Cotham* Hill has in the three years since it opened up earned a bib gourmand and joined forces with the oldest theatre in town. Some doubts were raised by the clinical looking first floor with its blue office building floor and the business-meeting appeal of the furniture. A shame of a setting for the most perfect food and coffee. 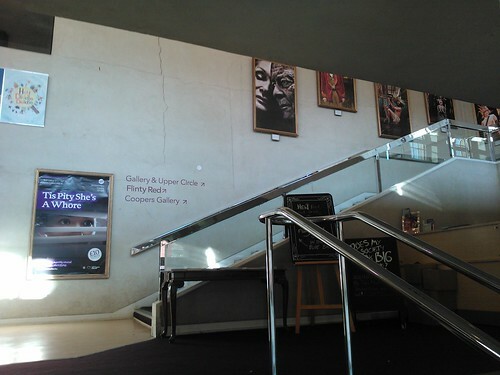 I mean just that particular section because the newly renovated Old Vic is surely lovely in all other ways. The soya latte was excellent. I mention it here first but I drank it there last as it is the one beverage in Bristol that is sure to disappoint. The homemade granola was delicately flavoured and crisp hazelnuts were a tasty accompaniment to my daughter’s favourite food, bananas (for an additional 30p). Our pastry was fresh and tasty and sweet and covered with a light apricot glaze and icing. We then picked up our things and went off to swimming. A quick and lovely breakfast as a treat to start our day. Not open early enough for the pre-work crowd (yet?) but just right for us. Flinty Red is open from 9am for breakfast and then continues for the rest of the day to provide food for lunch and dinner as well. It is one of the most wonderful restaurants in Bristol but until they renovate the restaurant area it is not a setting for special memories so hold off on the wedding proposals until you’re in the theatre. I heard about Herbert’s bakery when a four-day pop up restaurant took over at the site of the Runcible Spoon and I tried their egg and bacon sandwich. The bread was the overnight white bloomer from Herbert’s and I was determined to find it and bring some home. From the city centre it doesn’t take too long to head over to Stokes Croft and then turn up Picton Street (where a friend said it was located), past an Italian deli with Lavazza coffee cheaper than at the local Tesco supermarket and aisles brimming with imported tasty goods. As I arrived at Bell’s Diner and the Thali cafe I had to ask for directions because the place where Google maps suggested was quite blatantly bakery-free. I found it just past the Thali and around the corner. I also found brownies, lemon poppy seed muffins, almond croissants, sandwiches, organic white bread flour, Eccles cakes and a sultana scone. 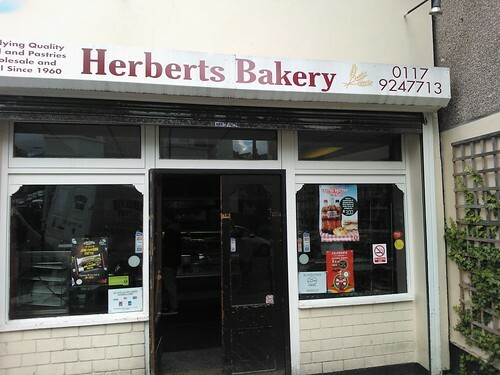 I then looked up all the locations where Herberts Bakeries deliver bread and discovered that one of them is about 500 metres down my road. 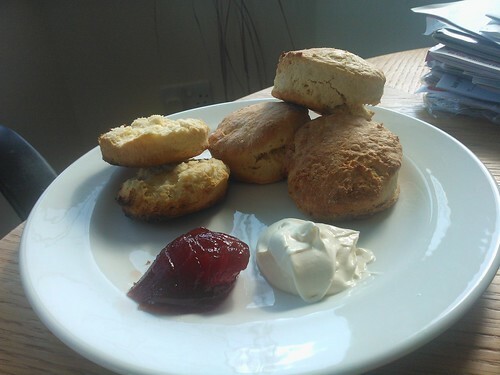 Here’s my tribute to the Great British Bake Off which is back on the telly, my attempt at Mary Berry’s scones recipe. It doesn’t take much – rub the butter into the flour; mix in the sugar; top up the two eggs with milk until you get to 300ml and then mix. Roll out on to a floured surface and cut with a round shape. Push round cutter in and then pull out, don’t twist. Breakfast suggestions were flying around Twitter this morning so I thought I would put together a top five for this weekend. 1. 40 Alfred Place is hosting a French pastry morning this Saturday with delicious taste sensations baked by Laura from Harts Bakery. From 8am till noon, they shall be providing a deliciously continental petit déjeuner avec croissants, pains au raisins, croissants aux amandes, pains au chocolat, baguettes, croque-monsieur et bien plus encore. 2. Lahloo Pantry in Clifton Village is probably the most wonderful place for cakes and tea plus one type of coffee. In addition they serve unlimited toast, boiled eggs and soldiers and French toast among other breakfast items. 3. Source food do the best pancakes with maple syrup and bacon. 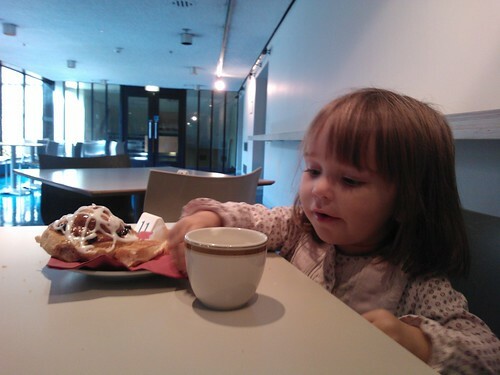 The pancakes are a bit teeny, however, which is strange as they are probably the cheapest part of the dish. 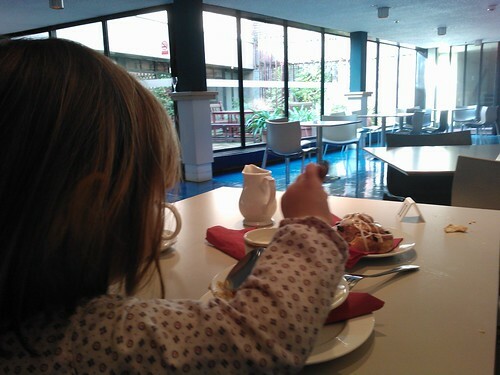 I have also had some lovely French toast and boiled eggs and soldiers there. Most importantly the coffee is good – Extract Coffee as also served at 40 Alfred Place. 4. Primrose Cafe at Clifton Village is quite nice if the weather is lovely and pleasant and you can get a table outside. They have fresh orange juice and very tasty cooked breakfasts and pastries. When I have to sit inside and it’s a little busy, my claustrophobia kicks in and the fact that they have the radio on is doubly annoying. 5. The Watershed on the Harbourside. My daughter loves their scrambled eggs so much that last time we were there she grabbed my fork and nearly ate all of mine. Bonus. Arch House Deli – Their food is amazing and they serve coffee and pastries. Not really dedicated to breakfast but still a very pleasant place. Brunel’s Buttery on the Harbourside – SS Great Britain and M Shed side – is also notable for its crowd-drawing abilities. I have yet to go but many Bristolian’s swear by its tastiness and hangover-curability. 1. 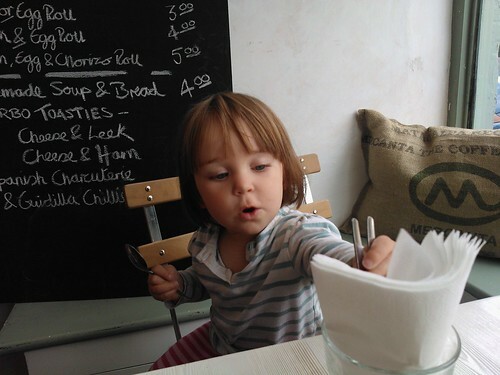 Rosemarino in Clifton: We visited on the Diamon Jubilee bank holiday Monday and I wasn’t that impressed. Their scrambled eggs were dry and their toast was drier. The other breakfasts looked very nice but their coffee was served in minuscule portions and their orange juice was served from individual bottles. Saying that, the restaurant itself was lovely and the music was pleasant. It may have been an off morning. Their pastries, made in-house, were excellent. 2. Bordeaux Quay on the Harbourside: The last time we visited they were so busy that the service was barely polite. The full English breakfast may have been local and ethically sourced but the homemade beans were bland and the sausage was tasteless. I actually still hold a grudge from the time I visited about a year ago and instead of serving me a stack of pancakes, the chef just made one big pancake which was entirely unpleasant as a visual experience. My adventures in different types of pancake have continued this week. I’ve been on a bit of a ricotta high after the blueberry success last week so when I only had half a cup of soy milk left and half a tub of cottage cheese in the fridge… well… the future just wrote itself. Add the flour and a pinch of salt to a bowl; make a well and add the egg, the soy milk and the cottage cheese. 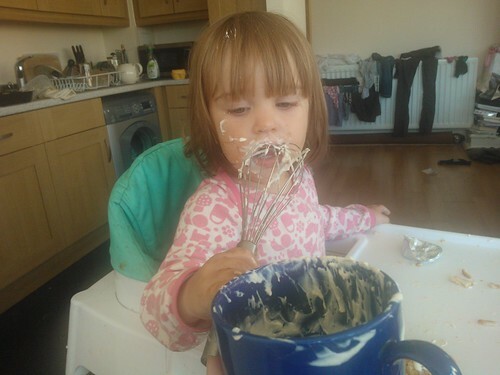 Mix enough to blend the ingredients. Add the blueberries and mix. The mixture is very thick and I used two tablespoons of mixture for each pancake. We added maple syrup.